Imagine your local playground—children running around, going down the slide, climbing on a jungle gym, parents lined up on the adjacent benches parsing their attention between their cell phone and periodic check-ins to make sure their child is visible and safe. This physical activity and practice of gross motor skills is important for children’s development. But can we ask more of our local playgrounds and of our public spaces in general? What if we combined physical activity and gross motor practice with an opportunity to exercise the brain—using concepts born directly from the science of learning?And what if these everyday places in our lives were infused with evidence-based math and science content that sparked precisely the kinds of interactions known to foster later school success? At a time when cities are re-thinking how to become more family-friendly, the implications of such possibilities could be vast, particularly for young children from low-income backgrounds who have less exposure to educational resources at home like puzzles, building blocks, or science kits. Enter Learning Landscapes, a bold series of projects that endeavor to bring playful learning opportunities into public spaces. These projects offer a new approach to informal education by melding the latest research in the science of learning with urban revitalization and human centered design. By infusing parks, bus stops, supermarkets, and libraries with rich learning opportunities—particularly in low-income communities—Learning Landscapes is leveraging the 80% of time children spend outside of school to promote learning and interactions between children and families. The latest of the Learning Landscapes projects, Parkopolis, is a life-size board game designed to promote math and science dialogue. The activities in Parkopolis offer developmentally appropriate learning opportunities for children ages 2-13 and their families. The first premise of Parkopolis is that kids make the rules. A welcome sign offers general guidelines to get children started, but the rest of the game is left open-ended so children and families can exercise their creativity and play Parkopolis the way they see fit. 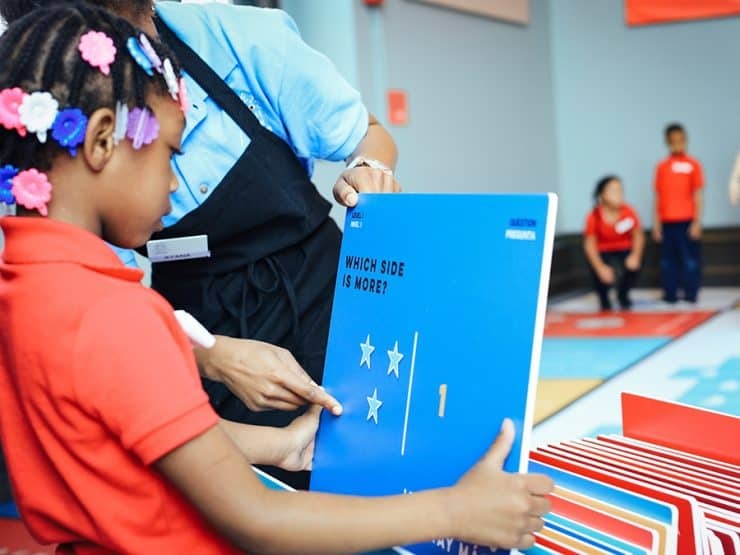 Parkopolis advantages research suggesting that linear numerical board games promote children’s math development, and children learn more effectively when they engage with their whole body rather than more passive contexts. Further—given that fractions are a common stumbling block for young learners—we reinvented dice to have whole numbers and fractions so children can have an embodied learning experience advancing two and a half or three and three quarters spaces down a number line as the spaces on the board and the dice are divided into quarters. 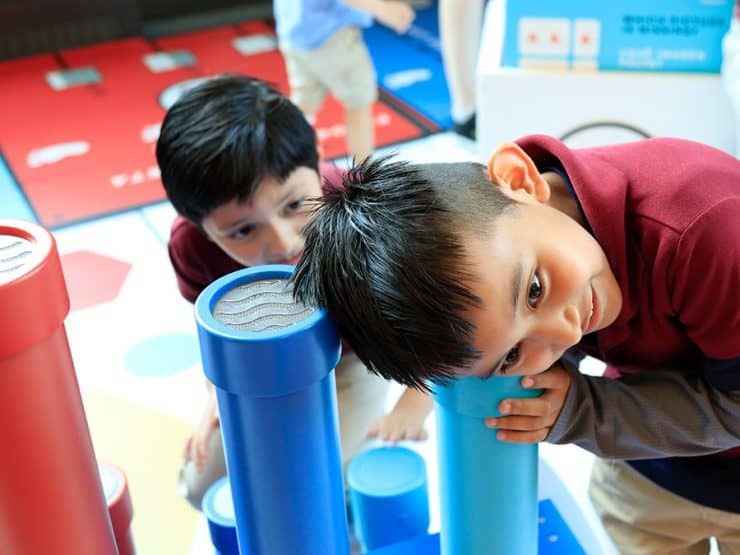 Parkopolis also includes musical tubes that allow children to play patterns and exercise their working memory by repeating a pattern or melody that a friend or caregiver just played. Patterns are a key element in both math and science education and are predictive of later math outcomes, and working memory is one of the three core components of executive functioning which also predicts later school success. 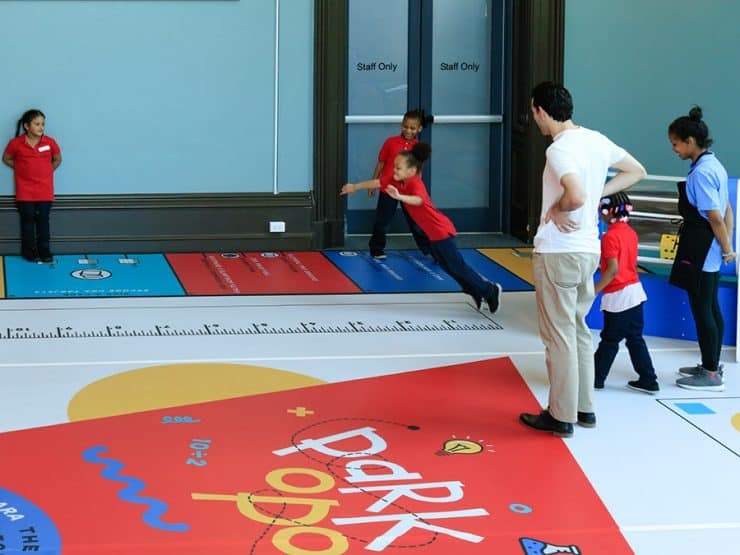 The giant ruler in Parkopolis allows for activities that combine gross motor skills (e.g., jumping) with measurement, which again, is a key aspect of math and science education. Children can also collaborate to find the difference between the shortest and tallest member of their families (subtraction), or measure how far their entire family can stretch holding hands (addition). 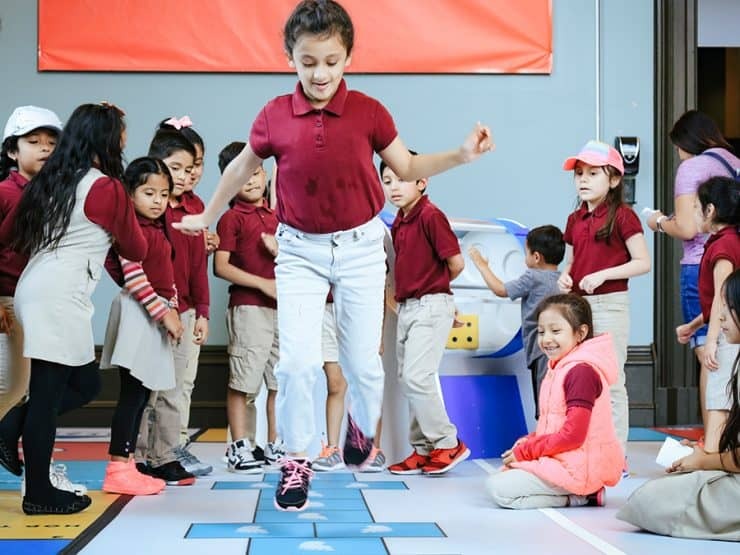 Parkopolis reimagines the playground game hopscotch with a new version—based on the Happy Sad Task—that targets executive functioning. By matching the random pattern of the feet, children exercise their cognitive flexibility (a core executive function skill) and shift their attention quickly as they jump. We also include game cards that reinforce cognitive inhibition (another core element of executive function) by asking children to use two feet when hopscotch shows one foot and one foot when it shows two feet. This activity requires children to inhibit their instinct to match the pattern of the feet and do the opposite. The shape zone allows children to exercise their early geometry muscles as they are asked to find all of the triangles in the shape zone; cognitive flexibility when they’re asked to jump with their left foot on all of the squares and their right foot on all of the diamonds; and working memory when their friend jumps on five shapes and they have to jump on the same five shapes in the same order as soon as they finish. The cards in Parkopolis offer challenges (all pulled directly from research in education and psychology) that engage, math, spatial skills, fluid reasoning, and gross motor skills. Finally, colorful signage encourages caregivers to get involved in play, ask questions, use math and science language, and encourage persistence. Parkopolis was piloted at The Please Touch Children’s Museum in West Philadelphia where we compared the game to another fun and engaging science-focused exhibit on rocket building. Observors blind to the hypotheses measured math and science language, parent-child interactions, physical activity, and cell-phone usage. Results suggest that caregivers playing Parkopolis used significantly more numeracy, fraction, reasoning, and pattern language than they did at the rocket building activity. Caregivers also asked more questions, engaged in more physical activity, and used their cell phones less frequently. Further, children playing Parkopolis used significantly more numeracy, fraction, reasoning, measurement, and pattern language, than did children in the comparison exhibit. They also asked more questions and engaged in more physical activity. This evidence that Parkopolis increased STEM language, interaction, and physical activity in caregivers and children was observed with over 300 children and families suggesting that it is an effective way to create playful learning opportunities that engineer the kinds of behaviors that scientists think will assist learning. Parkopolis could be built right into city budgets for parks and recreation, providing a scalable and sustainable model for dissemination. Parkopolis capitalizes on the way our brains learn best—through active, engaged, meaninful, and interactive playful learning opportunites. In those contexts, Parkopolis and the other Playful Learning Landscape installations can foster math and science development, particularly in children growing up in under-resourced communities. We believe it is time to dream bigger and to refashion public spaces so that all children have the opportunities to learn and grow. These efforts allow us to rethink public spaces by putting our core science to work in the community. Funding for this project provided by the New Profit Foundation. The author of this blog post, Andres Bustamante, was among the presenters at the conference.